Marietta mother, Rachel Goldschein, will honor her 5-year-old son with apraxia, Sammy Goldschein, at the second annual Walk for Children with Apraxia of Speech event on Saturday, May 4, in East Cobb Park. Last year more than 300 residents participated in the walk that helped bring local awareness to the motor speech disorder and raised over $20,000 to benefit the Childhood Apraxia of Speech Association of North America (CASANA). “I am passionate about apraxia since first receiving my son's diagnosis,” said Goldschein, who is coordinating this Walk for her second year in the Greater Atlanta area. Goldschein’s son was diagnosed with childhood apraxia of speech three years ago. 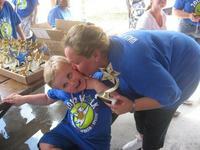 The 2013 Greater Atlanta Area Walk for Children with Apraxia of Speech is open to all adults and children. On-site registration, check-in, and children’s activities will begin at 8:30 AM, with the Walk starting promptly at 10:00 AM. Anyone interested in participating should contact Goldschein at savyrach@hotmail.com OR visit the website at http://secure.apraxia-kids.org/greateratlantawalk for more information, to register, or to make a donation.